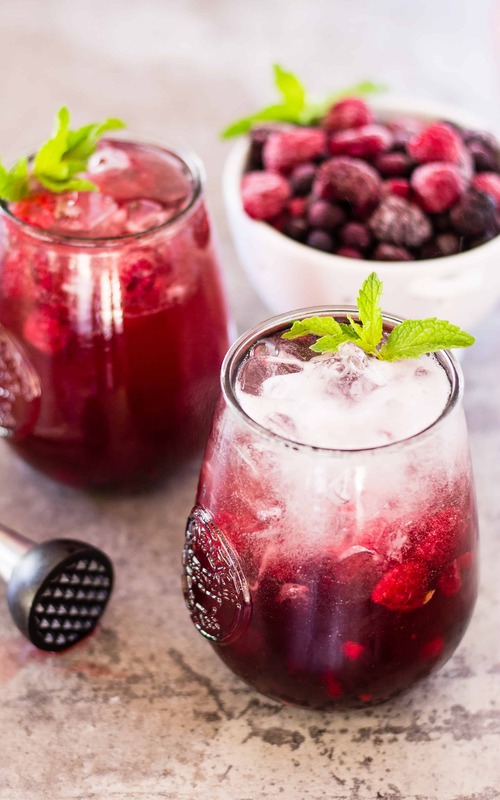 Enjoy all the sweet flavors of mixed berries and the tartness of red wine in a skinny cocktail. 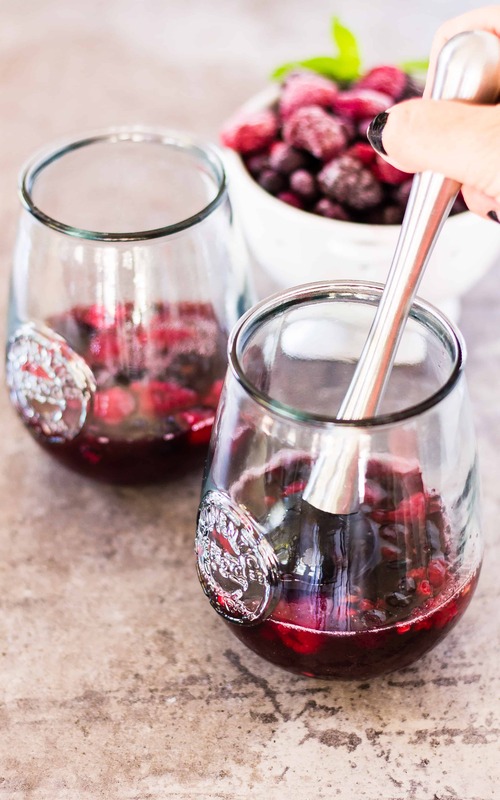 My Skinny Sangria Spritzer is perfect for any season! Is Sangria wine different than regular wine? Sangria consists of wine and other additions but you can buy sangria wine. The sangria wine sold in the bottle is wine already combined with fruit juices and spices. 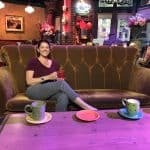 You can drink it straight and have it taste like the sangria that you are thinking of, but it doesn’t contain any brandy, triple sec, or even the fresh fruit. To me, the fresh fruit is the best part of drinking sangria. The fruit absorbs the wine and other spirits to make a boozy snack! When you want sangria for the fruits and the wine but don’t want all the calories, what do you do? All those fruits and juices add extra calories. So does the brandy and triple sec that usually get added in as well. 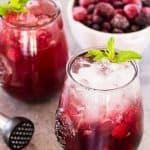 My Skinny Sangria Spritzer gives you the fruit and the wine but with less sugar and fewer calories! A regular 8 ounces glass of sangria can have around 260 calories or more depending on what else you add to it. How does less than half the calories sound? You too can have less than half because of the sparkling water! All the different flavors of sparkling water out there makes it super easy to skinny-fy any cocktail! The answer as to what is the best wine for sangria is simple. Any wine that you like to drink! 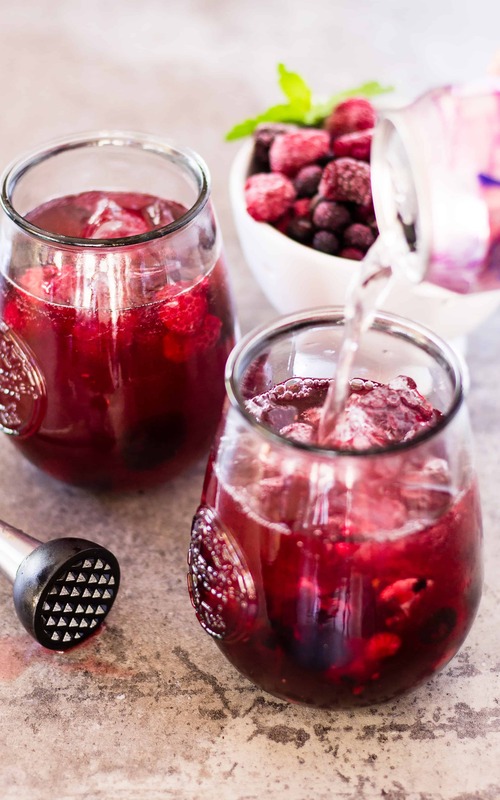 If you prefer a smoky, dark berry wine that is lush and velvety, make a sangria with other berries and warm spices like cloves and cinnamon. If you prefer a light and citrusy Pinot Grigio, make a sangria with lemons, grapefruits, and vanilla! You can check out my other tips for making the perfect sangria and start whipping up your own recipe. While you are doing that, try my Skinny Sangria Spritzer! There are a lot of variations on sangria because it is just wine and fruit and a few other delightful things. How many wines are out there? A LOT! I am currently crushing on Pinot Grigio and Rosé which make great summer sangrias that are light and refreshing! But that doesn’t mean that you can’t make a hearty and lush sangria from red wine. I love Pinot Noir because of the berry flavors! 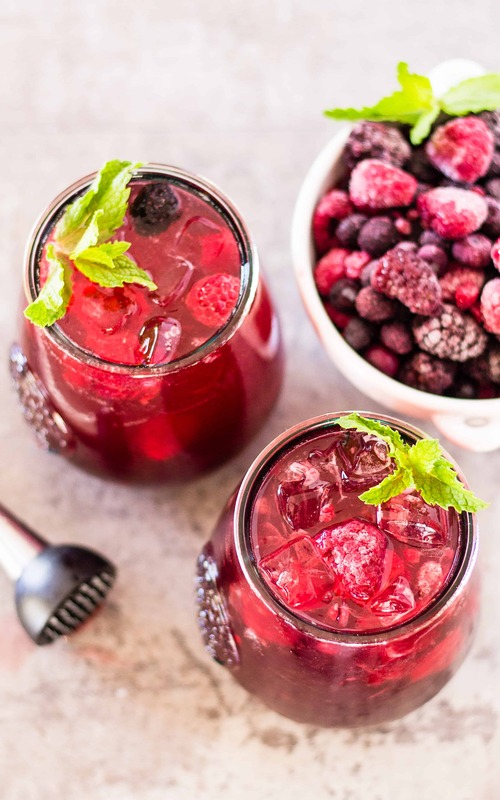 My Skinny Sangria Spritzer is a low calorie and low sugar sangria flavored with frozen berries and sparkling water! Perfect for summer or any season! Place the mixed berries in the bottom of your glass. Add the orange juice and lemon juice. Muddle until the berries are mostly crushed. Pour in the sparkling water. Yay Sangria! I love how easy this recipe is to make.